Boyer Ford Lincoln Bobcaygeon is a proud division of Boyer Auto Group. Boyer Ford Lincoln Bobcaygeon first open it’s doors on April 2, 2019. Having already opened and managed 3 Dealerships in the Kawartha Lakes and North Kawartha areas, Brandon Boyer was proud to expand Boyer Auto Group into the Town of Bobcaygeon with the Group’s first Ford Lincoln location! Boyer Auto Group has grown to become a premier Auto Group in southeastern Ontario. Throughout our history we have strived to deliver the best possible customer service with quality repairs, maintenance work and comprehensive new and used vehicle inventories. Our collective inventory has grown to house multiple brands, including Ford, Chevrolet, Cadillac, Buick, GMC, Chrysler, Dodge, Jeep, Ram, Kia, Subaru, Nissan, Mazda, Hyundai and more! Boyer Auto Group was founded in 1981 by Michael Boyer in Apsley, Ontario. At that time he was the youngest General Motors Dealer in Canada! As business expanded, Michael hired his brother Peter to join the growing team. Peter started his automotive career in the Parts Department and was quickly promoted to Finance and Insurance Manager. 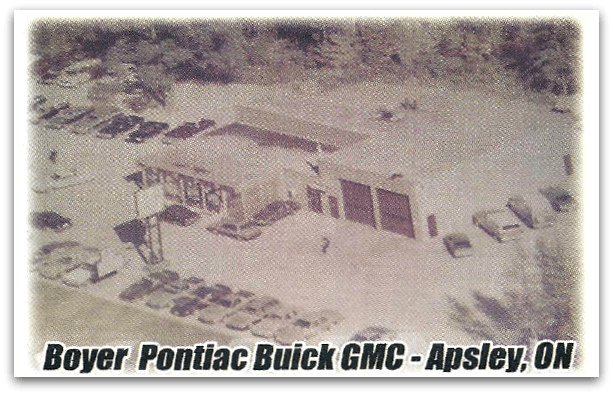 The two brothers, along with their loyal and hard working staff, continued to grow the business when Michael was offered the opportunity by General Motors to build and operate the new Michael Boyer Pontiac Buick GMC in Pickering, Ontario, which opened in 1987. This made Michael the first multi-point General Motors Dealer in GM Canada history! With his continued hard work and dedication, Peter was promoted to General Manager of the Pickering location and soon had aspirations of one day owning his own Dealership. In 1995 it happened! Peter opened the doors to Peter Boyer Chevrolet Buick GMC in Napanee, Ontario. In 2001 Peter added the Group’s first import brand, Boyer Kia in Belleville, Ontario which became the now Millennium Parkway Auto Mall. Over the next 15 years, Michael and Peter continued to expand the Auto Mall adding Bay Mazda in 2003, building Belleville Nissan in 2009 and acquiring Bay Subaru in 2016. Over that time, the Group also added 3 additional Dealerships – Boyer Chevrolet Lindsay in 2005, Boyer Chevrolet Buick GMC Bancroft in 2014 and their first Chrysler Dealership in 2016 – Boyer Chrysler Dodge Jeep Ram Cobourg. Construction on the Group’s first Hyundai Dealership is underway in Pickering and they opened their first Ford Lincoln Dealership in Spring of 2019 with Boyer Ford Lincoln in Bobcaygeon. Expanding into the Collision and Auto Body Repair business, Boyer Auto Group added the flagship FixAuto Pickering Central, rebranding their existing Boyer Collision Center at Michael Boyer Chevrolet Cadillac Buick GMC in Pickering. 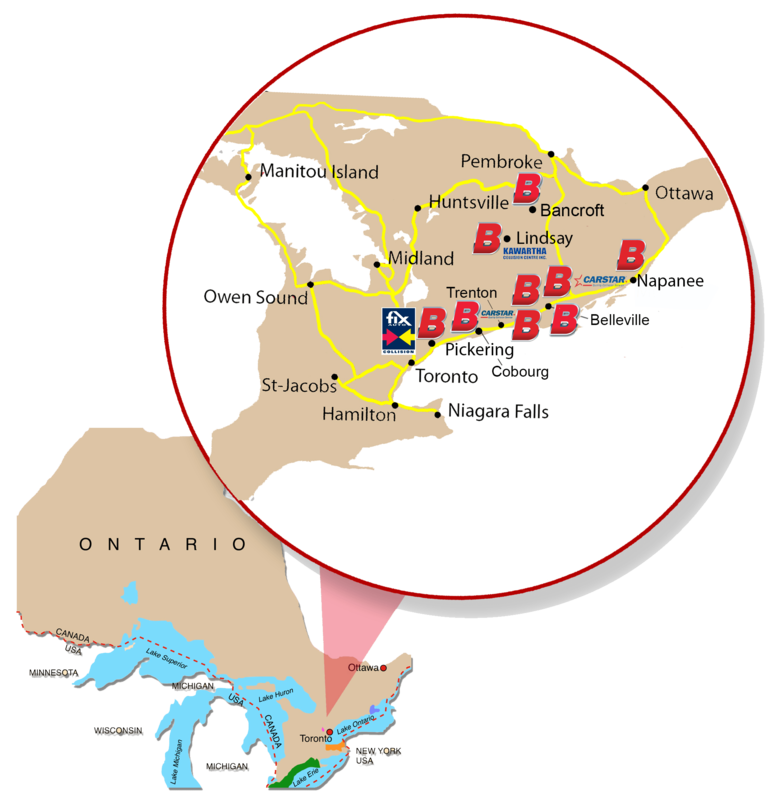 The Group also acquired CARSTAR Collision facilities in Belleville and Trenton. Most recently, the Group’s first independent stand alone body shop was added – Kawartha Collision Center in Lindsay, Ontario. Michael and Peter collectively oversee the Boyer Auto Group and entrust the day to day operations to their sons: Jason, Ryan, Brandon, Dustin and Daniel. Together with the General Managers and each Dealership Team, they promote employee and customer enthusiasm achieving successful Dealership operations. Boyer Auto Group, Your Family of Dealerships since 1981!